I’ve been doing a lot of playing with my Blendabilties lately in preparation for my talk at Team Day. Have I ever mentioned that I love them!! They make me look like I’m arty!! I discovered that you can colour silver glimmer paper with your blendies!! Happy Dance time!! Coloured bling!! This way, you can always have matching glitter. I don’t know about you, but I really love the Butterflies thinlits. I coloured my butterfly with the darker colour in the centre and on the outer parts of the wing and then a little bit of the next shade on the wings and then the lightest colour in the middle. I have found that blendies do seem to dry lighter if you are after a particular colour, make sure you do a test piece on a bit of scrap. And isn’t the Painted Blooms DSP just the loveliest DSP? It’s a bit hard to cut up, it’s so pretty but there’s no point in just looking at it!! Got to use it!! I also like the matching stamp set and the sentiments in it. Don’t forget that it’s still Sale-a-bration time and there are 3 ways you can earn products for free!! 3. Join my Stampin’ Up! team for only $169 and receive 2 SAB items or a free kit from the Occasions catalogue. Click here to join now!! « CTC 18 – Party time!!! Stunning card! 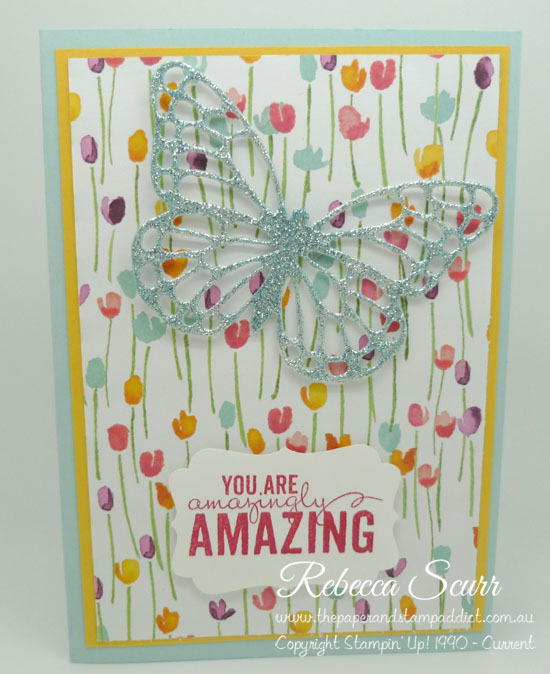 Your butterfly looks AH-MAH-ZING! I didn’t know you could colour glimmer paper with Blendabilities. Great idea! !